You are here: Home / Community / CABBAGETOWN FESTIVAL 40TH BIRTHDAY CELEBRATION! CABBAGETOWN FESTIVAL 40TH BIRTHDAY CELEBRATION! 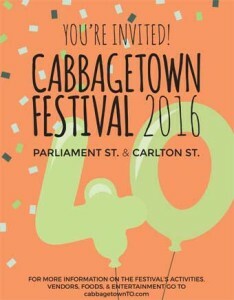 TORONTO, August 25, 2016 – The Cabbagetown Festival will celebrate its 40th anniversary this September. Don’t miss the great free events taking place September 10 and 11 on Parliament Street from Wellesley south to Gerrard, and Carlton Street from Berkeley to Parliament. Join us and bring your friends and family. The festival offers something for everyone! Live music will continue over the next two days with an eclectic group of bands playing up and down Parliament – groups like the St. Jamestown Youth Steel Orchestra and the Jim Heinemann Trio – a mainstay of the Toronto Jazz scene. Be sure to catch the Filipino line dancers, folk dancers and singers performing in front of the Filipino Centre on Parliament. Much of the food served during the Festival will be provided by local BIA restaurants, and will be as diverse as the music. Indulge in traditional Indian cuisine, Italian spiducci, Hawaiian BBQ, Malaysian delicacies, churros, roasted corn, freshly squeezed lemonade, pastries straight from the oven… and more! Bring the family to the Kids Zone for a true kids’ style birthday party in honour of the festival’s 40th birthday. The Kids Zone is located at a new location this year – on Carlton, between Parliament and Berkeley. The Bouncy Castle, a climbing wall and hopscotch will keep them active. The reptile show, arts and crafts table, balloon sculptor, and face painting will involve and wow them. And… free popcorn will be provided both days of the festival! Be sure to visit the Made-in-Canada artisan section, featuring the outstanding work of highly talented local artists. And great news for bicyclists: Park your bike for free at Bike Valet, a monitored bike parking service operated by Cycle Toronto and powered by Toronto Hydro. Enjoy the festivities, walking! In honour of the festival’s 40th birthday, an 800-square-foot heritage mural will be created now through September 2, led by local artists Poonam Sharma and Michael Cavanaugh. Don’t miss its unveiling during the festival on the outside wall of the LCBO Store on Parliament Street. Performing along Parliament to close the event September 11 at 7 p.m. will be Toronto’s premier samba reggae band, TDot Batu. This tightly knit Afro-Brazilian percussion group is an integral part of the Toronto Tropical music scene. It’s known for collaborating with members of the arts and music community to create spectacular participatory celebrations that reflect the vast colour and energy of Brazilian culture. Some of the other organizations generously supporting this year’s festival include: Canadian Chinese Radio, Chartwell Retirement Residences, CIBC, Cosimo’s No Frills, Daniels, Daniel et Daniel Catering & Events, Fair Trade Jewellery Co., Homelife, House on Parliament, Kumon, St. James Town Steak and Chops, The Epicure Shop, Toronto Community Housing, and Toronto Life. Founded in 1982, the Cabbagetown BIA was one of the world’s first BIAs. Representing over 100 businesses in Toronto’s historic Cabbagetown, the CBIA provides street beautification and community events, and acts as a resource to local businesses. Their most celebrated event is the annual Cabbagetown Festival, held every September. Find the CBIA at www.cabbagetownTO.com; and on Facebook: /Cabbagetown.TO, as well as Twitter and Instagram: @Cabbagetown_BIA. Be sure to check out these other community events taking place leading up to and during the Cabbagetown Festival: St James Town Festival, Aug 27th; Cabbagetown Short Film Festival, Sept 7th; Cabbagetown Arts & Crafts Sale, Sept 9th – 11th; Riverdale Farm’s Fall Festival, Sept 10th – 11th; The Cabbagetown Theatre Company Presents Sleeping Beauty, Sept 10th – 11th. Find out more about other local community events happening during the festival here: www.cabbagetownTO.com.